My nephews love it. I love it. I think my nephews are even likely to tell their pastor that. I encourage them to. I told them it’d always be the “right” answer in Sunday School…because, you know, faith is all about having the “right answer”. In all of those “lost and found” verses in the Bible, it’s not Jesus who is lost, but the other person. Even in that “seek and you shall find” passage, there’s no indication that it’s “seeking” Jesus. Seeking knowledge. Seeking enlightenment. Seeking salvation, liberation, wholeness…sure. So this idea that we can “find Jesus”…well, you might as well look behind the couch because I think you’re just as likely to find Jesus crouching there as you are to find him in the “seeker’s service” at your local big-box worship center. I’m not trying to come down harshly on “seeker services”; I think faith communities need accessible points of entry. But if we think we’re giving them Jesus, as if Jesus can be commodified…well, we should stop fooling ourselves. The search for Jesus is the search for the white stag…it’s pointless. Yeah, pointless. Because I think all you’ll end up finding is a mirror image of yourself that you pass off as Jesus. Instead the faith teaches that Jesus is/was/will be right where you are, and has been all along. This is absolutely unhelpful to the rational mind. The literalist, the legalist, the fundamentalist, they won’t accept that answer. There must always be a system, a way of finding, a problem/solution answer. But what if there isn’t? What if, instead, we leave those things behind and just agree to encounter the mystery of a present God, seen in the Christ, who subverts every single system and search, and who just surprises us as being on the scene? What if we just walk with mindfulness? It’d be a Biblical way of operating, that’s for sure. Jesus surprises everyone at the tomb, the house of Mr. and Mrs. Clopas, the upper room, Paul’s lonely road to nowhereville. Jesus surprises everyone in little Bethlehem (remember the Magi go six miles off course to Jerusalem to find him?). 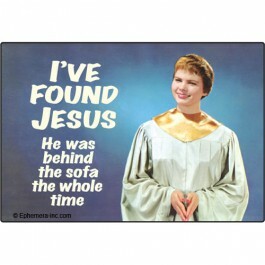 Hell, maybe Jesus is behind the couch. It’d surprise the socks off of me. But if you looked, you won’t find him there. Instead, it seems, Jesus finds us on the roads of confusion, in the upper rooms of fear, at the tomb of despair, in the little town of doubt. That seems to be Jesus’ way. This is why I don’t shy away from confusion, doubt, and despair. I don’t have to have it all worked out. This entry was posted in Heavy on the Jesus and tagged Bible, Jesus, Success by Timothy Brown. Bookmark the permalink. I’m sorry, I just do not understand your theology. You have overcomplicated and over analyzed the business of Jesus and the Bible. I feel like you have been told this before. I do apologize and now I will remove myself. I do appreciate you commenting. Obviously I don’t feel I overcomplicate Scripture, but rather feel it’s been overly simplified with easy answers and clear-cut theology that does more damage than good. But no need to remove yourself; that’s never my intention with any thought, post, or comment. We can all talk, all learn, all question (and provide answer) together. Oh how I love this. You articulate my viewpoint so clearly. That’s awesome. I think you just took a longer and more eloquent way of saying, “We don’t find Jesus, He finds us.” He was never lost in the first place. It’s kind of like that expression, “If God seems distant, who moved?” I do like your point about “accessible points of entry.” Sometimes our faith needs a little boost before we can open our eyes and see that Jesus was there all along. I like to call myself agnostic. This is the second post of yours that I’m reading. I like the “real world” way of teaching that you have. I’m intrigued and I’ll be reading more if you share it. Rock on sir. You have a viewpoint that I find refreshing and enjoy reading. Finding Jesus is pretty straight forward to me – you open the Bible and there He is. And you can open it any time and anywhere, when you’re anxious, depressed, happy whatever. In fact, if you don’t, you’ll have no idea what you’ve found in any experience or activity, or, more worryingly perhaps, what’s found you…. Absolutely. Scripture is the cradle that holds Christ. But often times I close the Scriptures and yet Jesus shows up. And that, in my experience, has been even more real. Thanks as always for your perspective, Clapham.